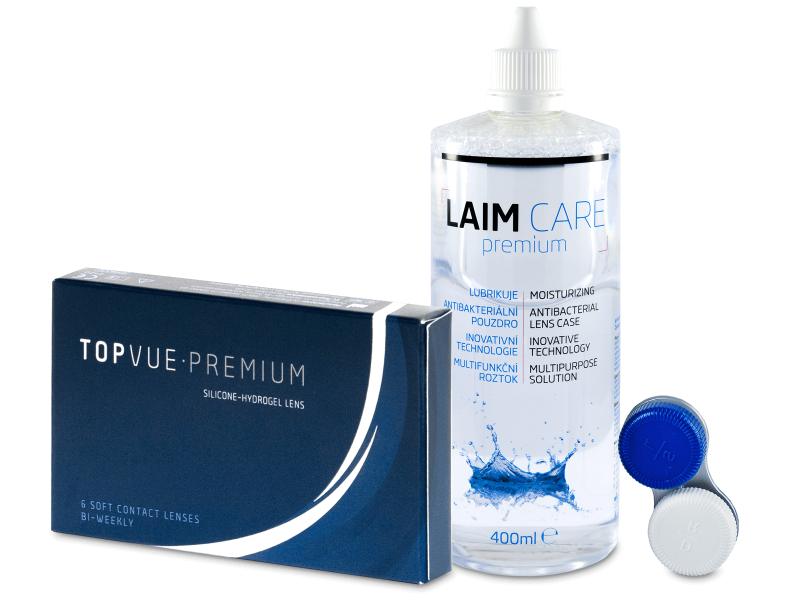 TopVue Premium are bi-weekly lenses made from a new generation of silicone-hydrogel material that provides comfort and all-day hydration. This package also contains a 400 ml bottle of Laim-Care solution. TopVue Premium bi-weekly contact lenses are produced by TopVue and are made from a new generation of silicone hydrogel material, which has been specially modified to ensure the greatest comfort while wearing and also to eliminate eye irritation as a result of dry lenses. Great service and attractive offers. I will be back to place another order. Rapid delivery and excellent service from start to finish. Many thanks. Pleased with both products, and the communication with tyhe customer service is great too. My emails were answered promptly with all the information I needed. Topvue are excellent lenses, and the solution works well. too. If you haven't heard of this brand, I encourage anyone to give it a try. Well priced and high quality. Just made the switch from purevision, and I couldn't be happier. 2 week lenses just seem to be more comfortable, and I'm very satisfied with these Topvue. Thanks! Great service. Many thanks for the good communication and fast delivery. I've worn other brands, but these keep their moisture throughout the day. I've never had any discomfort. The solution helps keeping that clean feeling. Definitely a good combination. Nice package deal, and even better with your 10% discount this week. Very nice solution, and it lasts me about 6 months with occasional use. Overall good value. Top quality lenses and a solution that lasts for ages. Very happy with this combo. Well priced offer, and excellent service provided. Nice value for the solution + lenses. I'm always happy to buy things in packages. Saves so much time and hassle. A friend recommended these premium lenses, and they're quite nice. Nice to buy a package with solution, too. One stop shopping is always preferable. Great package deal. I've always had positive experiences ordering through your site.